Few weeks ago, I found a baby robin walking in my driveway. It was not strong enough to fly away yet, but able to hop and jump while flapping its wings to just sail above ground. Perhaps it fell off the nest or it left its nest prematurely. As I followed it through my driveway trying to catch it and help it back to its nest, a couple of robins suddenly hovered agitatedly above my head and were chirping wildly. I reckoned they were the parents of this baby robin; and even though I am not Dr. Doolittle, I understood what they were saying very clearly. As a parent myself, I can feel their anguish, of seeing their child in harms way and yet feeling so helpless to save him. How can they protect their baby from this enormous creature (me!) who was trying to capture it. I hope I will not experience that feeling of helplessness ever. My heart was broken for these distressed parent birds. The baby robin now ran off to the street. I really need to capture it now or else a car may run over it. 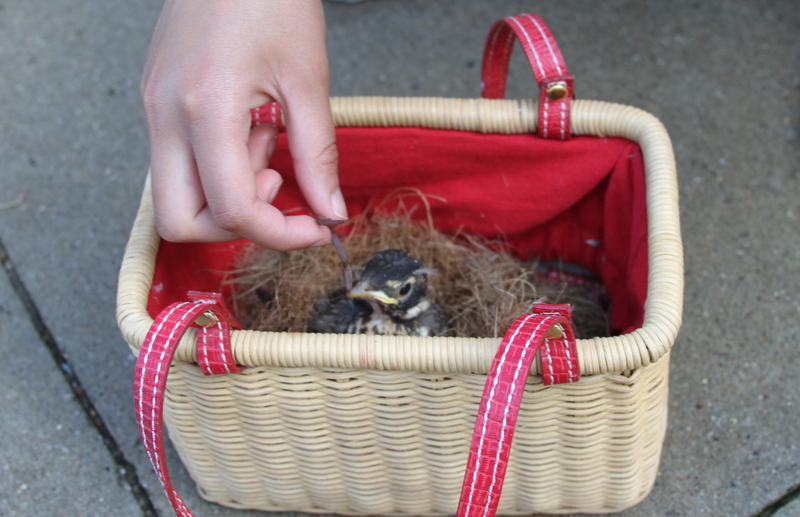 As I hold the baby robin in my hand, a whole flock of robins flew frantically around me and were making a ruckus. I learned that it takes a community to raise a baby bird. Their message was loud and clear: that baby bird I’m holding is one of them. If I can only speak their language (would that be tweeter?) and reassure them that I mean no harm to their baby, and my intention is to help it and restore it back to its safe haven. Yes, if only I could. My children then came out and saw the baby bird in my hands. They were excited to hold the bird too. They wanted to feed it, and so they dug up some worms and fed it to the baby robin. They even made a basket nest for it to rest. Perhaps the other robins saw that our intention was good, so they settled down and became quiet. Are we sometimes like the baby robin that wander away from the safety of our nest and find ourselves defenseless in a dangerous situation? Or are we sometimes like the parent birds who felt so powerless against a much larger adversary? Or are we at times like me and my kids whose intentions are good, but misunderstood? 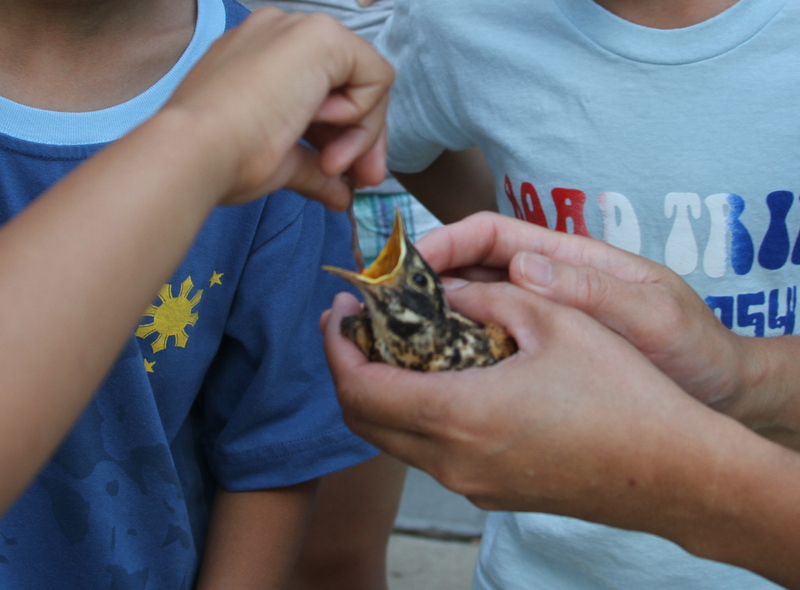 An hour later, we let the baby robin go to be reunited with its parents and the community of birds it belongs to. Fly robin fly……..or walk.